At one time, no one wanted to go to the Tower of London. It was usually a one way journey from which few returned. Nowadays, however, the Tower is one of the most popular places to visit in a city with numerous attractions. Why is the Tower now so popular? Undoubtedly, its rather gruesome reputation as a prison and a place of execution is part of the reason. There is also the Tower's royal connection. Although it is not a full time royal residence, it is where the fabulous Crown jewels are kept. Yet, another reason is ood way to all of the history associated with the Tower - - so many intrigues and tragedies involving famous figures have been played out within its walls. In addition, the fact that the Tower is conveniently located in central London also helps. In this feature, we discuss visiting the Tower. We'll give a brief overview of the history of the Tower, point out some of the things you can see there, and discuss the practicalities of ordering tickets and getting there. 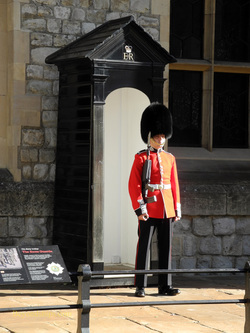 The Tower is guarded by a detachment of the Queens Guard from Buckingham Palace and by the Yeoman Warders. 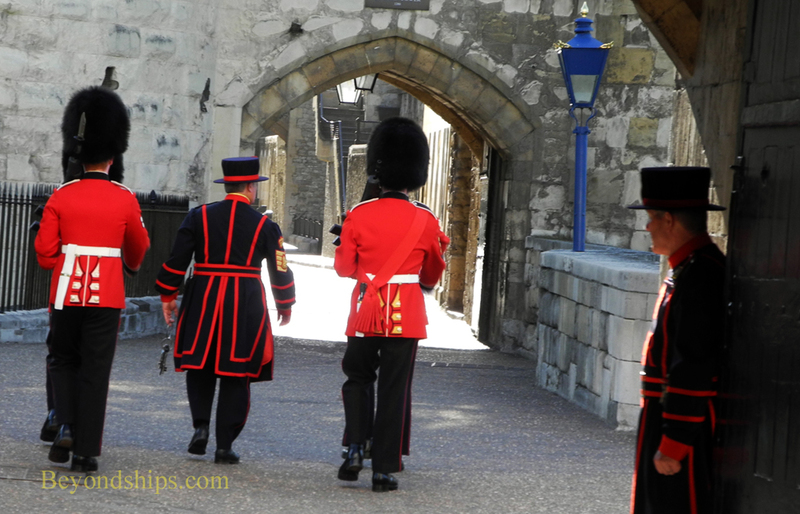 The Yeomen Warders, also called “Beefeaters,” were originally a body guard for the monarch. Today, they are required to have served for 22 years in the British armed forces. The Queens Guard is usually provided by one of the five regiments of Foot Guards. These are active-duty soldiers who also perform combat assignments. Each evening, the Guards and the Yeoman Warders perform the Ceremony of the Keys where the castle is locked down for the night. Visitors can attend the ceremony by writing to the Ceremony of the Keys office. 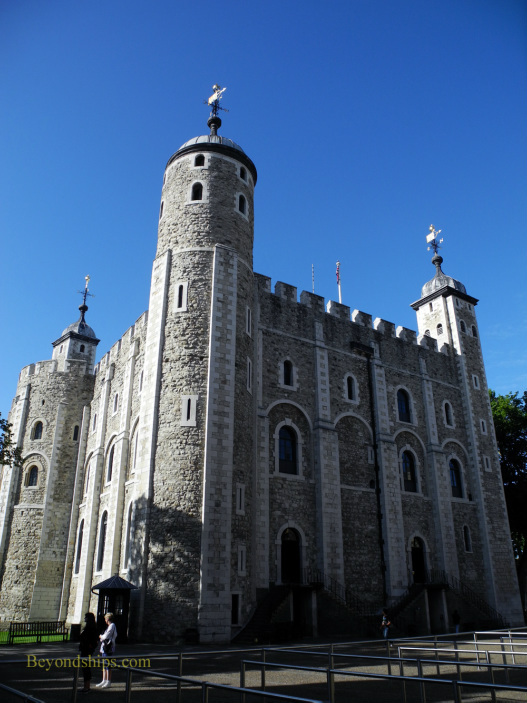 Although there may have been earlier fortresses at this location, the present Tower of London was begun by William the Conquer not long after he defeated the Saxon King Harold at the Battle of Hastings in 1066. 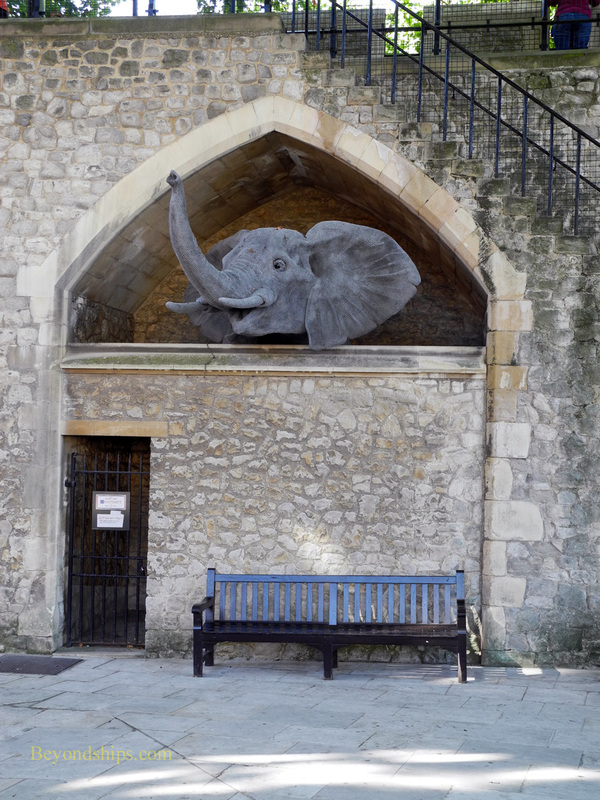 It was sited adjacent to the southeast corner of the walls of the City of London. The fortress was built as much to keep William's new subjects in check as it was to defend London. Over the centuries, the Tower was expanded several times, most notably by Richard I (the Lionheart), Henry III and Edward I. By the end of the 13th century, its present layout was pretty much established. The Tower did serve as a royal residence during the medieval period. However, during much of this time, the capital of England was Winchester, not London. After the reign of Henry VIII, the monarchs only came to the Tower occasionally. By this time, artillery had been developed and the Tower was becoming obsolete as a defensive position. As a result, the role of the Tower shifted to being a prison. Prior to this, many prisoners had been housed in the Tower including captured kings of France and Scotland. However, in the 16th and 17th centuries, the type of inmate shifted to high ranking individuals who were politically inconvenient. For example, Queen Mary I imprisoned her half sister Princess Elizabeth (later Elizabeth I) in the Tower, fearing that she might be plotting to take the throne. Most of these prisoners were able to live in comfort with servants and even members of their families joining them. The Tower's officials were not above making their guests stay easier in exchange for a fee. Of course, overshadowing these physical comforts was the thought that many prisoners never re-emerged from the Tower. The Tower continued to be used as a prison well into modern times. Nazi leader Rudolph Hess was held there briefly during World War II and a German spy was executed by firing squad. Other uses the Tower has been put to over the centuries include being the location for: the Royal Mint; the Royal Observatory and the Royal Menagerie. It continues to be the repository for the Crown Jewels. Parts of the Tower have been open to visitors since Elizabethan times. In 1669, the Crown Jewels were put on display. The first ticket booths for the Tower opened in 1851. Today, over two million visitors a year explore this UNESCO World Heritage Site. 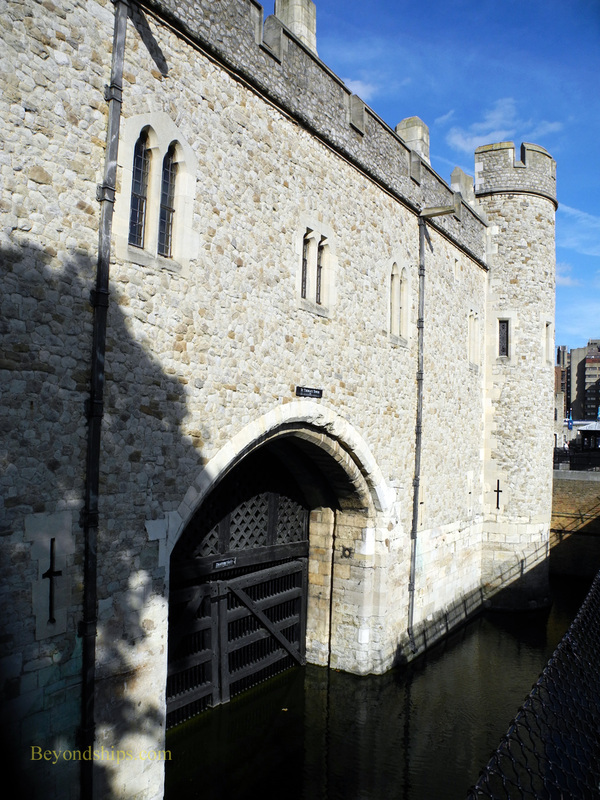 Above: Traitor's Gate provides a water route into the Tower. Prisoners could be brought down the Thames to the Tower after being tried and/or condemned in the palaces upstream. Above left: Seven ravens live at the Tower under the care of a raven master. 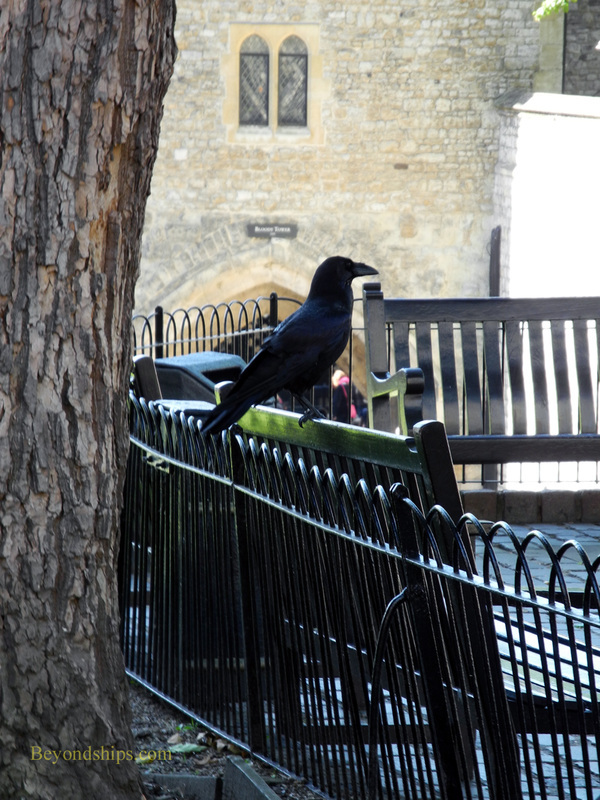 Legend has it that if the ravens leave, the kingdom and the Tower will fall. Above right: Ravens are not the only animals to lived at the Tower. It was the home of the Royal Menagerie from medieval times until 1830, when its large collection of exotic animals became the nucleus for the London Zoo. Above: The Queen's House on Tower Green is the residence of the Governor of the Tower. It is reputedly the most haunted place in the Tower with the ghost of Arabella Stuart, cousin of James I, being the most prominent.